Myself and a friend found this place by accident last year, I took two trips - the second one ended abruptly as security noticed us and started patrolling in their 4x4! 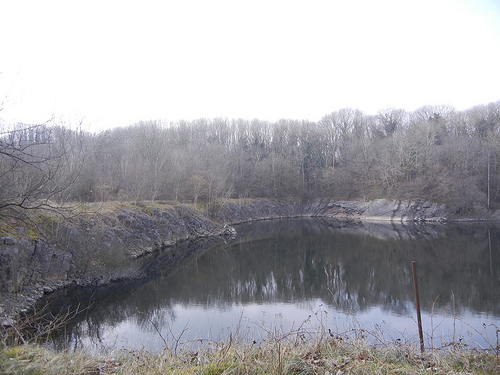 From what I can dig up (mostly wikipedia, unfortunately) this inactive quarry was probably originally owned my the Mendip Quarry company - and is currently believed to belong to the Emborough Stone Company. It is inactive and the lower part of one of the quarries is completely flooded. There is a set of steps that leads down to the water though! It is comprised of two large quarried out areas, the first of which (from our point of view was it was our point of entry) has another lower level which is completely flooded. Running around the edge of this area is a narrow gauge railway system. Following this track (in either direction - it is circular) takes you to a large viaduct, apparently a siding of the Somerset and Dorset railway that would have served the site. Logic dictates that this is probably the reason for there being two quarries as it cuts between them. 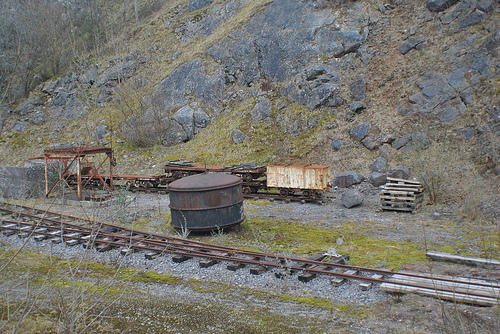 On the other side of the viaduct is the area that grabbed our attention most - the second of the two quarry basins - which appears to be some sort of industrial vehicle graveyard. There are several buildings situated here - one of which seems to have been repurposed as a vehicle store as there is a crane poking out of one side. Again - can't seem to find much info on who might own this machinery - wikipedia says Richard Wood engineering, but I have no way of confirming this. Would definitely recommend a visit on a nice summery day - very interesting place and nice to explore, chill out and take interesting photos! 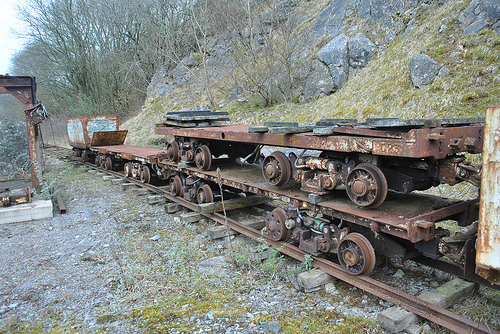 A little siding off of the small gauge railway around the quarry containing some ruined equipment. 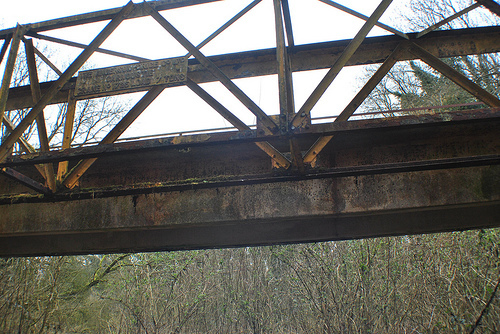 Some of the rails did show signs of recent maintenance though. 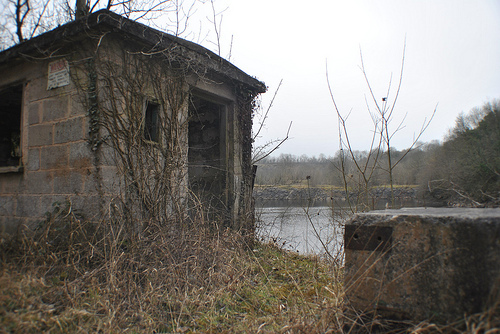 This hut contained remains of some mechanical/electrical equipment - and there looks to be the remains of some sort of mount for a machine off the edge of the quarry. 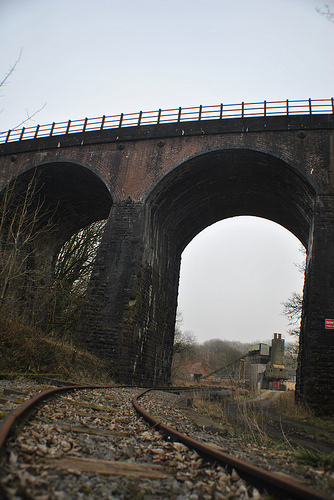 A view of the S&D viaduct splitting the two quarries. Some of the buildings and equipment. 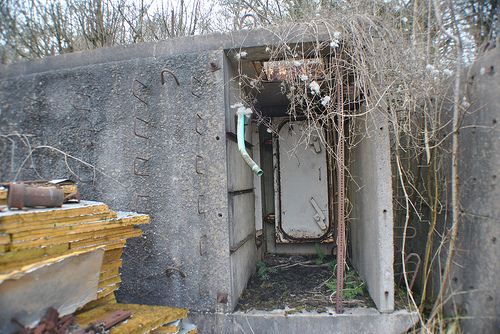 Could not work out what this is - it's like a modular part of a building but with a hatch in the ceiling of that entrance area and an airlock-type door leading in. The door did seem pretty airtight as well but I didn't dare close it! 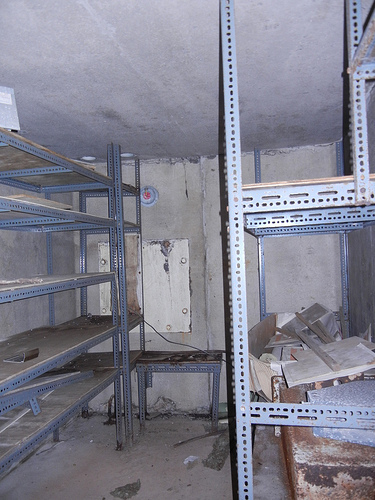 Inside the strange airlocked bunker. 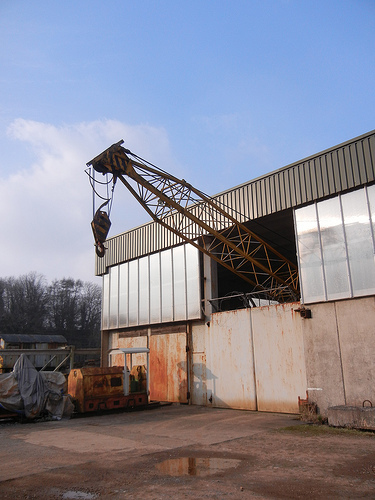 The crane is Smith Rodley 25631 built 1962, moved to unknown location in Scotland 5 Oct 2016. 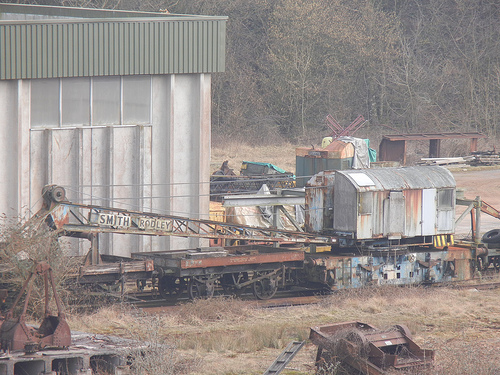 The narrow gauge loco seen in the photo title "Crane poking out of the back of one of the buildings" is 750mm 4wDH (diesel hydraulic) works No. 55134 (this is actually the engine number) manufactured by GIA Industria AB, imported from Finland. GIA Model Type DHS-40 Serial Number 114 built 1966, originally fitted with Jenbacher Works (JW) diesel engine of 40 ps engine number 55134. Built new for Stockholms Stads Gaukontor as #23.